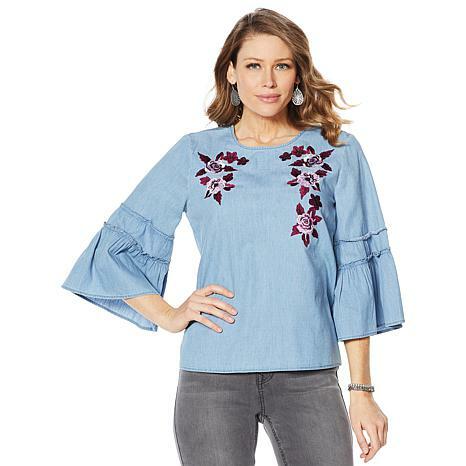 Easy does it with this lovely, lightweight embroidered denim blouse! 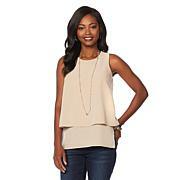 Pair with your favorite skinny jeans and sandals and usher in the season in style. 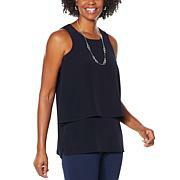 Semi-fitted at bust with easy fit at hip. Use Bust Measurement to determine size. so cute and flattering.i got the ivory or white one. I too hope it does not shrink. It looks like it would not hide your tummy, just looking at it, but when you put it on it does hide any muffin top you might have. thanks. 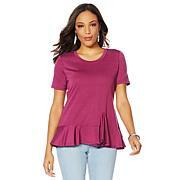 Loving this great looking blouse. Different from anything else in my wardrobe. I bought it to go with the leaf embossed wide leg cropped denim pants ( like the model) & it makes a stunning outfit! It runs a little smaller than I expected ( I bought a small... usual size is medium but I am small through shoulders & 35 bust .. Medium would be too big I am afraid. Hope it doesnt shrink. Love it !!!!! This is so upscale !